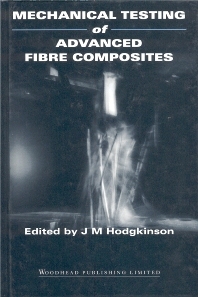 General principles and perspectives; Specimen preparation; Tension; Compression; Shear; Flexure; Through-thickness testing; Interlaminar fracture toughness; Impact and damage tolerance; Fatigue; Environmental testing of organic matrix composites; Scaling effects in laminated composites; Statistical modelling and testing of data variability; Development and use of standard test methods. Dr John M. Hodgkinson is Deputy Head of the Centre for Composite Materials at Imperial College in London. He is a member of the Institute of Mateirals, being a founder member of Council and Chairman of the Applied Polymer Science Committee. He has also chaired the Aerospace Materials and Structures Committee at the Institution of Mechanical Engineers and has organised numerous conferecnes and seminars. He is Editor-in-Chief of the Journal of Aerospace Engineering.